Advance news: Our AGM will be held on Saturday May 18th, 11am-12 noon in the community space in St Peter’s Church, Walsden – just next door to our Walsden development site (see below). The AGM will be followed by an (optional) visit to the site, to see how the builders are getting on! We have now fixed the date for the launch event for the new Community-led housing in Calderdale initiative, which the CLT is coordinating in conjunction with Calderdale council. We’ll be showing a short film about community housing developments in Leeds and Liverpool, Britain’s Housing Crisis: A people-powered solution. There will also be contributions from local groups already engaged in community housing projects of different kinds. We are absolutely delighted to report that building work has begun on our development in Birks Lane, Walsden. This is where we are building six independent-living bungalows for local older people, to be let at affordable rents. The development – such a long time in the planning – is in partnership with local almshouse trust John Eastwood Homes, who will take over two of the bungalows when they are complete. The builders started on March 7th, and we had a small ceremony on site that morning to mark the occasion. The development is scheduled to take 34 weeks, which means that the new homes should be ready for their first occupants very late in the year. This newsletter is going out to quite a number of extra email addresses this month, to the group of people who have signed up in the last four weeks as new members of the CLT. We have now climbed from 95 members at the start of Feb to 124 today. As you would expect, the CLT trustees have been carefully considering all the avenues open to us for the proposed High Street, Hebden Bridge development, following the rejection (by three votes to two) of our plans at the February planning committee. We will be explaining the pros and cons of the different routes forward to our members at the AGM on May 18th, and will be bringing a proposal to the membership to be voted on then. As we’ve said previously, CLT members will have the final decision on how/whether we proceed. AGMs are member events. If you are a supporter of our aims but not yet a member of the CLT and would like to be with us on May 18th, there is still time to join. If you are a member you will receive the agenda and papers in a separate mailing nearer the time. The CLT has been approached by Todmorden Development Board and Calderdale Council and asked whether we might be potentially interested in participating in discussing proposals for the redevelopment of Rose Street and Bramsche Square, right in the heart of Todmorden. Our view is that, yes, we are indeed potentially interested and will be pleased to contribute our ideas for what is a very high-profile site. It’s early days yet, of course, but this is the sort of thing which the CLT was established to be able to do. The CLT was represented (along with Friends of HB Station and the newly formed Hebden Bridge Signal Box Preservation Group) at a recent meeting with two Network Rail staff members. We are discussing the possibility of the building (now decommissioned) passing into community ownership. Everything takes a long time with Network Rail, but the meeting did at least take us a small step forward. We’re now waiting for NR to get back to us, and for them to facilitate a visit to the box by our chartered surveyor (our Chair, Simon Brearley). 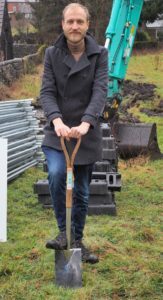 (Press release, Mon March 4 2019) An innovative community-led housing initiative which will see the construction of six new independent-living bungalows in Walsden gets under way on Thursday March 7th. 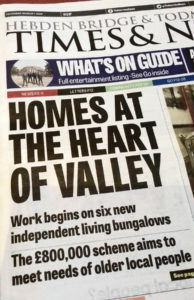 The bungalows, which will be let on affordable rents to local older people, are the result of a successful partnership between the Calder Valley Community Land Trust, the Todmorden-based almshouse charity John Eastwood Homes and Calderdale Council. 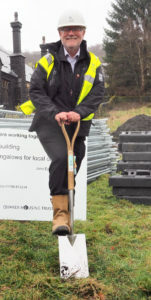 The Walsden project is the first development for Calder Valley Community Land Trust, and as such represents a real landmark for the organisation. The CLT was set up in 2014 as a charitable community benefit society to bring affordable housing to the upper Calder Valley, under direct community-led control. The CLT now has over a hundred local people who support its work and have become members. Under the scheme, four of the bungalows will be owned and run by the Community Land Trust, while the remaining two will be owned by John Eastwood Homes. The almshouse trust, set up under the terms of Todmorden resident John Eastwood in his will, already operate twelve similar bungalows in Walsden. The land for the bungalows has been gifted to the CLT by Calderdale Council, which has worked closely with the organisation since its incorporation. The development, which will cost about £800,000, is being funded in part from the reserves built up through prudent financial administration by John Eastwood Homes, in part through government grants made available through the Homes England agency, and also through other grants and loans. The Quaker Housing Trust is contributing £45,000 in loan and grant finance, and around £60,000 is being lent by local people investing in the CLT through a community share issue. Calderdale Council is also making a grant, in exchange for nomination rights. The help and support of Homes England during the planning of the project has been another crucial aspect of the success of the venture. The Walsden development represents one of the first investments by Homes England in a community-led housing development in this part of Yorkshire. You won’t be surprised that much of this newsletter this time is about the aftermath of last week’s Planning Committee. As you’ll have gathered, councillors voted at the Committee to reject our application for twenty affordable homes in Hebden Bridge. The voting was three councillors against our plans, and two in favour. (The officers’ recommendation was to approve). We are naturally feeling bruised and we’d like to thank everyone who has been sending us emails (and also posting on social media) in support of the CLT’s work. We’d also like to thank everyone who came along to sit in on the Planning Committee. By our maths, there were 23 people there supporting the application. Our planning application was a very long time in preparation (over three years), and the overwhelming response in the town to the early consultations we held in 2016 and 2017 was positive. Negative voices only began to be heard in any volume last summer, when of course we were very well advanced with the plans and were about to put in for planning. We continue to believe that, by bringing High Street back to life, our new street of homes would have very quickly become a feature of Hebden Bridge life that people would have been proud to show off to friends and visitors. 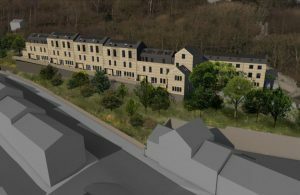 Sustainable, energy-efficient, well-designed, offering homes to our local young people – this is surely what a lot of people in Hebden Bridge would want for their community. You might expect us to want to rip into the arguments raised against the proposal, which we think were generally weak. We’d feel better if we did let rip, no doubt, but that’s not what we intend to do. Planning is a democratic process, and people are entitled to oppose as well as support. (All we will say is that quite how the development would have adversely affected air quality is beyond us. Town centre developments within walking distance of trains and buses seem to us exactly what we should be doing to reduce traffic). A commercial developer would at this point almost certainly decide to appeal the planning decision, and/or would resubmit the plans (no doubt slightly tweaked). The CLT is not a commercial developer. We’re a charity and we seek to be properly accountable to our communities in the upper Calder Valley. So the trustees decided when we met earlier this week that we are not going to rush in to taking any hasty decisions. We intend to weigh up all the options. We also want to be careful not to incur unnecessary further costs if we can help it, when the outcome is clearly uncertain. What we have decided is that the final decision on what the CLT should do or not do about the High Street proposal should be taken not just by the trustees but by all the CLT membership. (CLT members are the CLT’s sovereign body). Details in due course. In the meantime, we are very aware that there are a lot more than our current 95 members who endorse what the CLT is trying to do, so we have decided to be resolutely upbeat and to launch a new membership drive. The membership form is on the website, at www.caldervalleyclt.org.uk/docs/membership.pdf . If you’ve been in touch recently supporting our work but haven’t yet become a member we’ll also email you separately. (Members take out a £1 membership share in the CLT, which is constituted as a community benefit society – a kind of member co-operative). 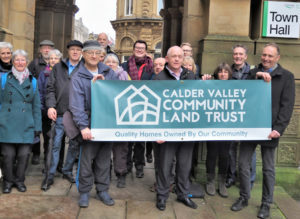 Calder Valley Community Land Trust is enormously disappointed at the decision by Calderdale’s planning committee today (Feb 5) to reject proposals for new affordable homes to rent in Hebden Bridge. The not-for-profit proposal would have seen twenty new homes built on the site of the former High Street, a densely packed terraced area of the town bulldozed in the 1960s. The council’s decision comes after more than three years of detailed planning for the new homes by the local member-based charity. The plans, as presented to planning, had been designed and refined following four well-attended public consultations in the town, as well as a drop-in exhibition session in Hebden Bridge Library. The councillors on the planning committee went against their own officers’ advice, which was to permit the Community Land Trust’s development. They also went against verbal statements in support of the proposal, made at the committee by local ward councillors Cllr Sarah Courtney and Cllr Dave Young, and by Town Council leader Cllr Carol Stow. The land in question is scheduled for residential development under the Calderdale Local Plan (approved by Council and now with the Secretary of State). Three councillors voted to reject the application, and two voted in favour. The sixth member of the committee, the Chair Cllr Sweeney, had withdrawn from the meeting since he himself is a CLT member. Twenty-three members and supporters of the CLT were in the planning committee room, to listen to the councillors’ discussions. He stressed however that this setback will not prevent the CLT from continuing in its mission of creating low-cost quality affordable homes to rent in the upper Calder Valley. The builders of the CLT’s first development, of six independent living bungalows at Walsden, are scheduled to be on site very shortly. The CLT also owns the Fielden Hall community centre in Todmorden and is in discussions with Network Rail about the long-term conservation of the heritage Hebden Bridge Signal Box. “Although this has been a highly disappointing afternoon, and the decision went against us by the narrowest of majorities, we want to thank all those friends who gave up their time to come along and join us for the committee meeting,” Simon Brearley added. Our March newsletter is now out. Feb 2019, Jan 2019 newsletters. 2018 newsletters sent out in Dec, Oct, Sept, Aug, June, May, April, March, January. 2017: Dec, Oct, Sep, May, April, March and February. Personal data: our policy on data protection can be read here.